Here at camp, we are so excited about all of the changes going on around Crestridge. A lot of progress has been made on the Beehive since our last update. The siding is almost all up on the outside, just waiting to be painted. The walls are up on the inside both upstairs and downstairs and it looks great! It is amazing how different the inside looks with the walls up between the rooms and everything. It is coming along very nicely… It will be an awesome place to hang out this summer! We also have a few other construction related projects going on around camp. The telephone pole that used to be in front of the store was moved down the hill a little so it isn’t right in front of the Beehive. Also, something that will be really nice are the new windows that are being put in the gym. The new windows are already in one side of the gym and it is crazy how much more light those windows are letting in! Can’t wait until the summer when you all are here and get to enjoy all of these changes and additions as well!! 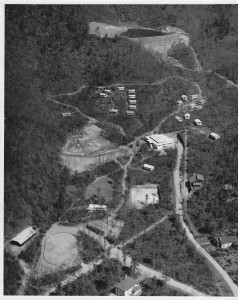 If you start at the bottom of the picture, the gate is past the Lodge instead of before it. There is no Kitchen Boys’ House, Horseback Cabin, Small Riding Ring, Landsports Hut, Store, Chapel, Crafts Building, Zipline, Slide, Blob, Gym, Cherokee Cabins, and the list goes on. 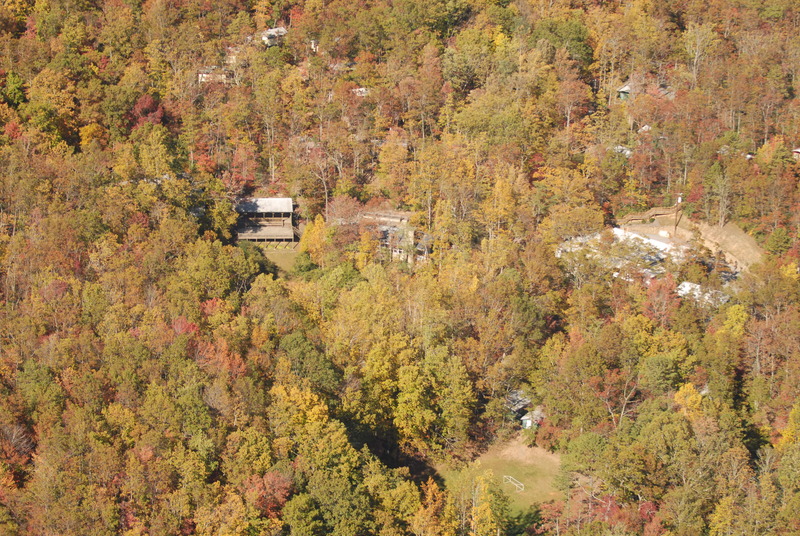 The one cabin you see on Cherokee Hill started out as Arvine Bell’s house. 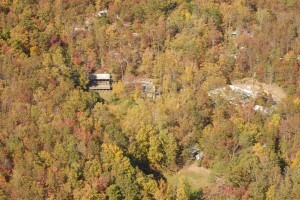 We’ll talk more about that cabin in a later post. Something else that is interesting is the amount of “dead” space behind the lake towards the green. All the tall trees we have were not grown yet. You could see the mountains behind the lake. 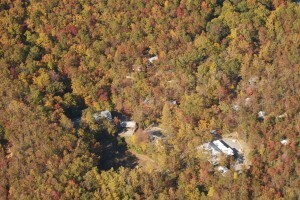 We had the opportunity to take some aerial photos of camp in 2008 just before the new cabins and Bear Trap were added. 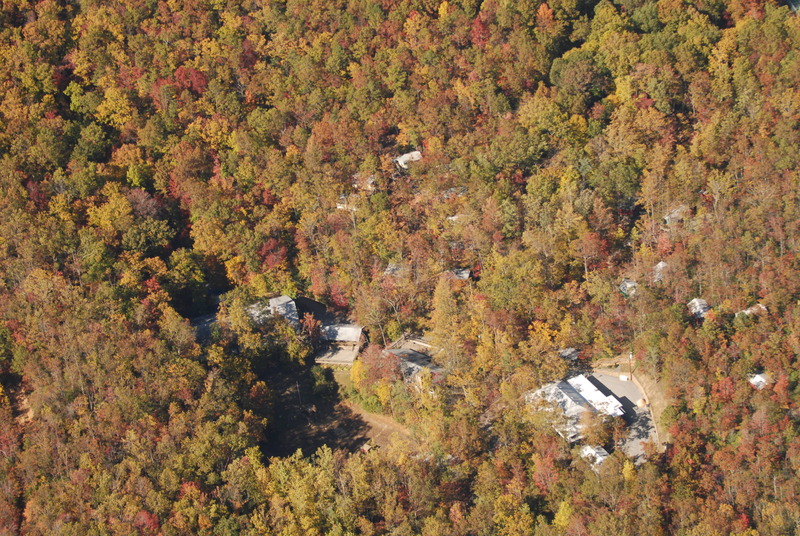 These pictures didn’t turn out as good because there were still too many leaves on the trees, but you can see how much camp has grown since the beginning. We sure do have a lot to be thankful for!